Join us for our third annual Opening Night Gala, featuring Vanessa Hua and Paula Saunders. Limited tickets available at Eventbrite. 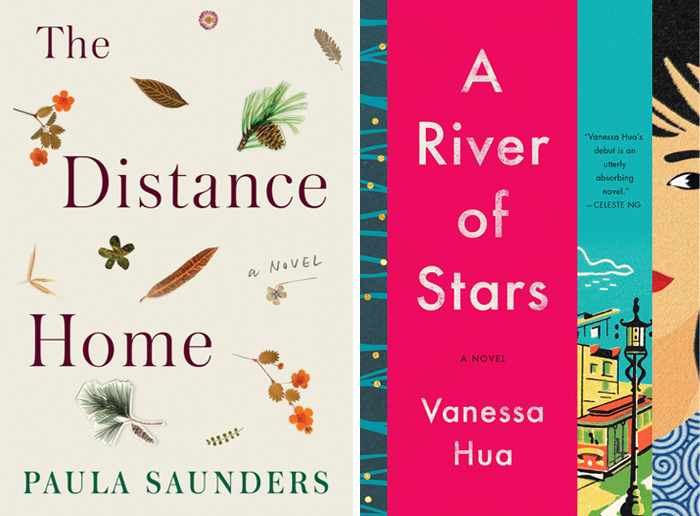 To kick off our sixth season, we’re welcoming two Northern California writers with novels hot off the presses, Vanessa Hua (A River of Stars) and Paula Saunders (The Distance Home). Both novels are moving and memorable explorations of family in all its complicated glory. Authors will be on hand to sign books, and the evening will also include a silent art auction, savory and sweet bites, and a refreshing Pimm’s Cup cocktail. 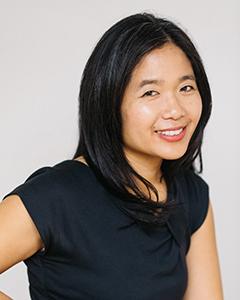 Vanessa Hua is a columnist for the San Francisco Chronicle and the author of a short story collection, Deceit and Other Possibilities, and a debut novel, A River of Stars. For two decades, she has been writing, in journalism and fiction, about Asia and the Asian diaspora. She has received a Rona Jaffe Foundation Writers’ Award, the Asian/Pacific American Award for Literature, the San Francisco Foundation’s James D. Phelan Award, and a Steinbeck Fellowship in Creative Writing, as well as honors from the Society of Professional Journalists and the Asian American Journalists Association. 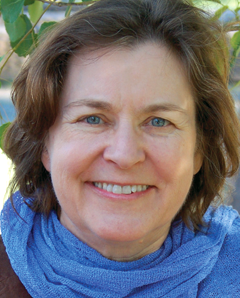 Her work has appeared in publications including The New York Times, The Atlantic, and The Washington Post. She lives in the Bay Area with her family. Paula Saunders grew up in Rapid City, South Dakota. She is a graduate of the Syracuse University creative writing program, and was awarded a postgraduate Albert Schweitzer Fellowship at the State University of New York at Albany, under then-Schweitzer chair Toni Morrison. She lives in California with her husband. They have two grown daughters. Ashley Lucas will read an excerpt from A River of Stars by Vanessa Hua. Lucas has appeared on stage in several Sacramento Community Theatre productions, from children’s theatre and comedies to drama. 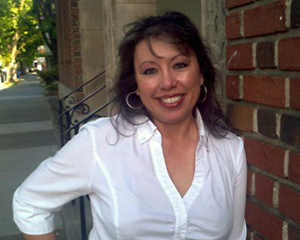 She has also read fiction for Stories on Stage Sacramento and many plays for the Playwright’s Collaborative. Recently, Lucas has narrated Waiting for a Comet by Richard Prosch on Audible Books. In the evenings you can find her walking her dog, Cabo, and, on rare occasions, her husband, Wade. Gail Dartez will read an excerpt from The Distance Home by Paula Saunders. Dartez is a professional actor, director, and teaching artist. She is elated to have this opportunity to share “Stories on Stage.” Her directing credits include The Arsonists (Capital Stage); Antigone, The Rover, Two Gentleman Of Verona, and The Exit Interview (Big Idea Theatre); Orlando and The Turn Of The Screw (Sacimpulse); and various productions at Cosumnes River College. Dartez has also directed Precious Stones (Chicago), The Three Musketeers, and Romeo And Juliet, and served as co-director for Wait Until Dark, The Baby Dance, and The Gifts Of The Magi (New American Theater, IL). Her acting credits include Romeo And Juliet (Davis Shakespeare Festival); Love and Information, The Typographer’s Dream, Les Liaisons Dangereuses, and Relatively Speaking (Capital Stage). In the Bay Area and beyond, she has performed in venues such as The Magic Theatre, Bay Area Playwright’s Festival, Berkeley Shakespeare Festival, Long Wharf Theatre, Yale Repertory Theater, and the New York Stage and Film Company. Dartez holds an MFA in Acting from the Yale School of Drama. Have you previewed our upcoming sixth season yet? 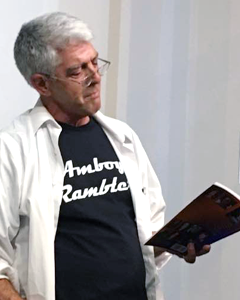 We’re excited to bring you a mix of emerging writers with first books published or soon-to-be-published, like Jamil Kochai and Tommy Orange, as well as returning favorites with fresh work, like Colin Winnette, Pam Houston, and Shobha Rao. Keep checking back as we finalize our 2018-19 calendar. Since our series is especially dedicated to showcasing the work of California authors, we think it’s fitting that our third annual Opening Night Gala fundraiser will feature two Northern California writers with debut novels out this summer, Paula Saunders and Vanessa Hua. Publisher’s Weekly writes that Saunders’ novel, The Distance Home, “wonderfully depicts the entire lifespan of a singular family.” Saunders’ book has been longlisted for the 2018 Center for Fiction First Novel Prize, and we’re rooting for Paula, along with two of our authors who also appear on the list, Shobha Rao and Tommy Orange. We can’t wait to share another Opening Night with you on September 8, 2018! If you’d like to be notified when gala tickets go on sale, sign up for our monthly mailing list below, and you’ll hear about it first. Join us at our Season Five Opening Night Gala and fundraiser, featuring award-winning science fiction and fantasy. Tickets are sold out—thank you! 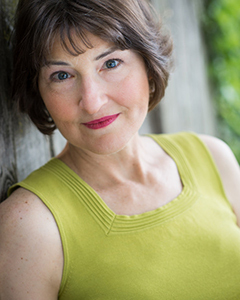 To kick off our 2017-18 season, best-selling author and Booker Prize finalist Karen Joy Fowler will present two writers she selected for Best American Science Fiction and Fantasy 2016, Will Kaufman and Liz Ziemska. The evening will also include a silent art auction, good eats, and—back by popular demand—a refreshing Pimm’s Cup cocktail. 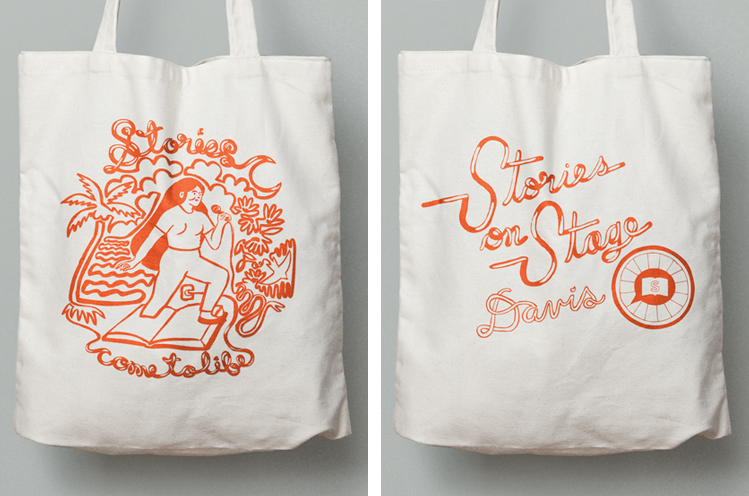 Every ticket comes with a Stories on Stage Davis canvas tote bag, designed by Davis artist and writer Madeline Gobbo and screenprinted by Sacramento artist Eric Frankenstein. 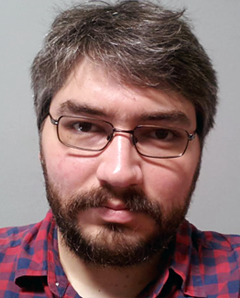 Will Kaufman’s work has appeared in a number of publications, including Lightspeed Magazine, [PANK], and McSweeney’s Internet Tendency. He received an MA in Creative Writing from UC Davis, an MFA from the University of Utah, and attended the Clarion Workshop in 2013. He currently lives in LA, where he works as an editor at Edmunds.com. You can find Will online at www.kaufmanwrites.com. 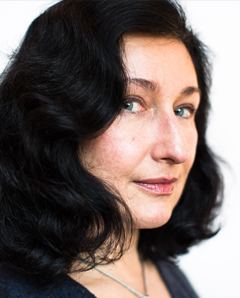 Liz Ziemska is a graduate of the Bennington Writing Seminars. 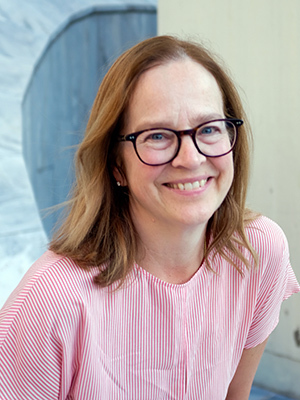 Her work has appeared in Tin House, Interfictions: 2, Strange Horizons, Best American Science Fiction and Fantasy, The Pushcart Prize XLI, and has been nominated for a Shirley Jackson Award. A novella entitled Mandelbrot the Magnificent is forthcoming from Tor/St. Martin’s Press in November 2017. She lives in Los Angeles. Kelley Ogden is an accomplished performer, director, and producer whose work has been seen throughout the area. 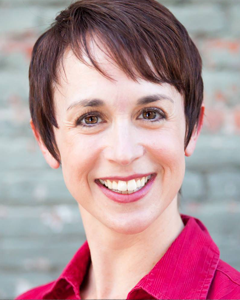 Co-founder of acclaimed fringe theater company KOLT Run Creations, she has performed with Capital Stage, Sacramento Shakespeare Festival, Main Street Theatre Works, and Theater Galatea, among others. She earned her BFA in Performance from The Theatre School at DePaul University in Chicago. Phillip Larrea was a prolific actor as a young man, appearing in many Sacramento area community productions and ultimately working professionally in New York in off-Broadway productions, summer stock, and touring companies. He gave it up because he doesn’t like working nights and weekends. He does, however, love doing the occasional one-night stand. Nowadays he is more known as the author of three books, Our Patch, We the People, and, most recently, Part Time Job.